The Friends of the Library and the Friends Bookstore are having a Book Sale in two weeks, as part of WINTERFEST in Rochester MN. SAVE the dates (February 11, 12, Thurs and Friday). This is an overstock sale so there will be fabulous books at great prices. Perfect for cozy readings on these freezing nights! You will find alot of books to create your own reading lists, as well as many that are on mine. ENJOY! I am often asked where I find my books. The Rochester Public Library is often first stop (both the website and general browsing), then the Friends bookstore (because I love owning books, and at those prices can share with the ‘you must read this book’) and the Amazon site, using the Friends portal (which donates money to the Friends, and therefore the Rochester Public Library. Then of course, I have several favourite ‘booksellers-by-post’ : the first is Bas Bleu (Fr for bluestocking, e.g. a literary woman). Their catalogue is fabulous and the online site is easy to negotiate (www.basbleu.com). I also receive the Daedalus catalogue where items are displayed by category, and have publication dates. Sale prices can excellent, and they have dvd movies and cds. Ordering online is through salemusic.com. If you have plenty of time to search the catalogue, Edward R Hamilton Bookseller also has great deals. Catalogue is usually packed, some have photos of covers, various editions come as newspapers with rock bottom prices. EdwardRHamilton.com provides a mechanism to search online, but I generally print the order and post it. These three have very different inventories, but I generally cross reference: I have found as much as $10 difference per title. For example, Chasing Spring, new was $22 at Amazon, 6.99 at Daedalus, and 3.95 at Hamilton. I read this as a library book in 2009, infact it was a new author, and I went on to read all his books. 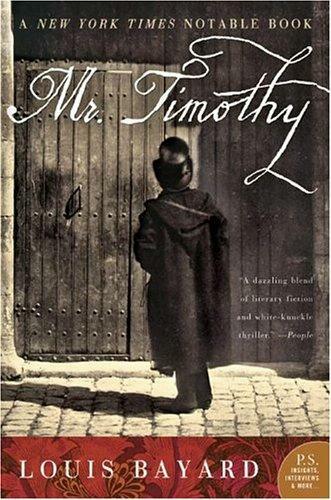 This is an atmospheric account of Tiny Tim Cratchit, now the grown up Mr Timothy. I enjoy reading all his book reviews as well. The important point of this posting, is that I just purchased this book from the Friends Bookstore for a mere dollar!! First edition, in nearly mint condition, no one else even looked at the book (and I couldn’t believe I had missed it since it was in the store from September onwards!). There are absolutely amazing deals in this store. I love my thesaurus, but after reading this book, decided I needed to update mine (third edition) and then thought ah ha, perfect Kindle book, expecting it to be free (see below). Peter Mark Roget worked on a project classifying words for almost 50 years, amassing over 15,000 words, finally publishing his manuscript as Roget’s Thesaurus of English Words and Phrases Classified and Arranged So as to Facilitate the Expression of Ideas and Assist in Literary Composition (1852). Roget, born in London Jan 18th, 1779, had a long and distinguished career as a doctor; he lectured, he invented a slide rule that did complex mathematics, he studied optics and made an important breakthrough about how the retina perceives images. When he retired, he returned to the thesaurus, a compilation of words arranged in categories. Roget’s Thesaurus has never been out of print, is now in it’s 6th Edition (2002) and contains more than 330,000 words in 1075 categories. It was part of the Gutenburg project, and is available for free as a download. On Kindle and Nook, however, you will pay $10, if you don’t know about pdf files. This week’s New Yorker has a great article on Neil Gaimen. CHECK it out! I recommended reading his biography last year (huge 800 pages that I got on Kindle, with wonderful commentary on most of his books). Latest comments and tweets even. The Rochester Public Library has this, as they have purchased most of his novels, comics, dvds, etc. And while you are at it, yes, revisit the dvds of Star Dust, Coraline. He has another in the making (Staturesque) just recently filmed. Yes, this is the same Caleb Carr that wrote the wonderful The Alienist and the Angel of Darkness. I had no idea that he wrote so much non fiction, nor that he was in fact extremely knowledgable in military and political history. He is a contributing editor of MHQ (quarterly journal of military history)and series editor of the MOdern LIbrary War Series. This is incredibly insightful, well written, and conservative while providing a critical historical context for terrorism today. He does argue that it will fail, but it appears to me it takes more education (of all of us, and them!) and if history is anything to go by, peace will not happen in my lifetime. Hence depressing. But I found many useful definitions, and connections with other historical accounts that made this a useful book.